Born in New York City, she grew up in Teaneck, New Jersey. Her first musical instrument was the piano, which she began practicing at age four. Her singing began while in high school with local choirs and performing with a few select classical vocal groups across the U.S. and other venues abroad. Most memorable was a seven-country tour of Europe in 1996 with the U.S. Youth Chorale. As a student Melissa received numerous awards including 3 gold cups in the New Jersey Federation of Music solo piano competition, top ranking in the New Jersey all-state choir, and runner up for the New Jersey Governor's award for vocal music. Inspired by the classic recordings by Billie Holiday, Dinah Washington, Nancy Wilson and Sarah Vaughn, Melissa pursued her love of Jazz through studies of music. She attended the SUNY Purchase Conservatory of Music, studying with many prominent artists. During her tenure, she appeared with the conservatory's Jazz and Latin Jazz Orchestras and was featured vocalist with the Purchase Jazz Band during a 1999 tour of Spain. She graduated from the Purchase in 2002 with a B.A. in music. She has since performed as a regular at several of New York's top jazz venues; Cleopatra's Needle, Flute, G Bar, Smalls, Smoke and St. Nick's Pub to name a few. At that time, Melissa performed with her own trio; as well as with other artists in the New York area. She was featured in performances with Jon Faddis and the Dizzy Gillespie Alumni All-Stars at the Blue Note in New York in 2001. In 2002 Melissa performed at the New York Women of Jazz Festival at Smoke jazz club. Around this time she was also a guest on the Metro TV-NY program "Where to hear jazz in New York City". Melissa competed and became a semi-finalist in the 2004 Thelonious Monk International Jazz Competition in Washington D.C., "the most prestigious jazz competition in the world, hosted by Billy Dee Williams and Herbie Hancock. Judges for the competition were luminaries Quincy Jones, Al Jarreau, Kurt Elling, Jimmy Scott, Dee Dee Bridgewater and Flora Purim." Melissa moved to Los Angeles, California where she pursued a recording career for a number of years. She has now moved to the Bay Area, where she continues to perfect her art, and can be heard performing in numerous venues. 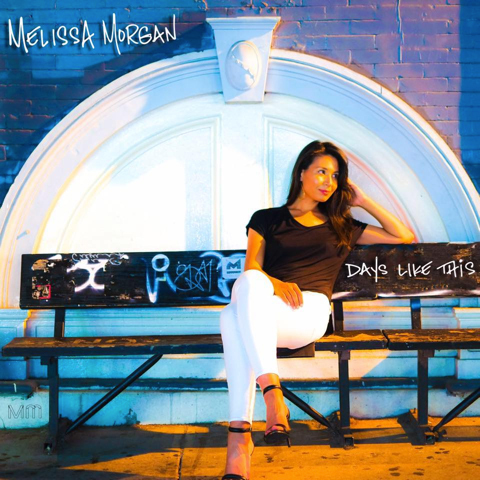 "Melissa Morgan’s new album, "Days Like This," is more of a reintroduction than a bold new step. She made a strong impression back in 2009 with her debut album “Until I Met You” (Telarc), a critically hailed session featuring a stellar cast of young musicians led by pianist Gerald Clayton... It’s a blues-oriented session, which means Morgan is in her element. She delivers the title track, a Mose Allison classic, with such a tart world-weariness that she seems like his long-lost daughter. She sounds crisp and authoritative tearing through Wes Montgomery’s standard "West Coast Blues," but her aching version of “You Don’t Know Me” and captivatingly sultry take on "Wild Is the Wind" make me long for a whole program of Morgan singing ballads and torch songs." “Many young jazz vocalists reach into the book of standards for their first recording. Melissa Morgan follows the tradition, but in a way that works to her advantage. Many young jazz vocalists reach into the book of standards for their first recording. Melissa Morgan follows the tradition, but in a way that works to her advantage. "The tendency of new recording artists to cover standards can work against them as they're not giving the audience anything they haven't heard. However, Morgan succeeds with the combination of her vocal style and free-spirited arrangements. Until I Met You, named for the Donald Wolf and Freddie Green classic, is an excellent introduction to Morgan."